1935 Duncan's Gold Seal Yo-Yo Winners. Each winner is wearing their award sweater vest with the patch. They also appear to each be throwing a Duncan Gold Seal yo-yo. "If you could learn to walk the dog, go around the world and over the falls, rock the baby, loop the loop and do the three leaf clover, along with other yo-yo tricks, you had a chance to win an official Duncan All-American Yo-Yo sweater vest. If that didn’t motivate you, maybe it was enough just to show off your mastery of the popular toy. 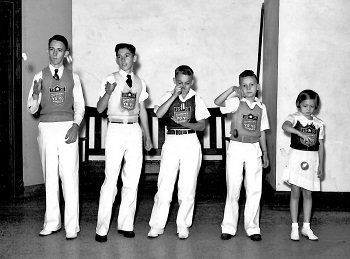 In June 1935, The Illinois State Journal implored every boy and girl who cared to enter the newspaper-sponsored contest, to get a genuine Duncan gold seal yo-yo and 'start practicing for the fun event of the year.' The contest called for entrants to master eight different tricks. To teach the necessary skills, the newspaper brought in a team of experts, the Tennessee state yo-yo champions. Competitions were held daily for a month throughout the city in parks and on playgrounds, and the coveted sweaters were awarded every day. Above, the Tennessee champions, from left, Victor Cooley, Odie Patterson, Billy Napier, Frank King and Nancy Pearre. File/The State Journal-Register."